I was baptised along with my older brother, sister, and mother way back in about 1943 or 1944. I would have been about five years old. We were living in Des Moines, Iowa, Dad was our pastor. The baptising was done by sprinkling. I can’t find any certificate or record of this day, only the memory of Richard, my brother, and myself. I think my baby brother, Billy, was probably also baptised at the same time, although I have no record. There is a reason why we weren’t baptised before as babies or small children. Mother and Dad had become born-again Christians when I was about two years old and before that they hadn’t attended church, so no baptising. The second time I was baptised I was an adult. I was married and had four children; one more baby boy joined our family later. Life was good. 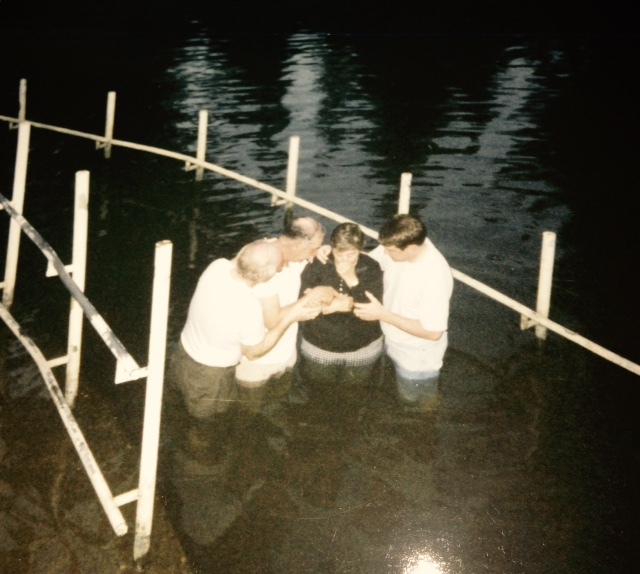 I had a personal relationship with Jesus and I felt it was time to be baptised as an adult. I was immersed. Our new church building had a baptismal pool? tank? installed on the platform. I was the first person to be baptised in it! This means something to me but not to anyone else! The third time I was baptised in the Jordan River in Israel! Jerry and I were both retired and on a trip we had often dreamed of. When we were at the Jordan River where Jesus had been baptised (it was probably not the exact site) we were told we could be baptised. Jerry wanted to immediately even though he had been baptised as a teenager. I didn’t want to, I had already been baptised and didn’t need to do it again. But then we were told couples could be baptised together! “You mean, at the same time?” I asked. Oh, we looked at each other and suddenly I knew this was right. So we were baptised together in the Jordan River! Our own Pastor Dave Kessler and the leader of our group, Dr Glen Williams from Indiana Wesleyan University baptised us. Dr Williams, Jerry, Me, Pastor Dave. What a wonderful, meaningful experience for Jerry and me. Even though we had established a Christian home when we were married, it was like we rededicated our lives and mainly our marriage to the Lord. We both felt so close to God and to each other! In my denomination, Free Methodist, folks wanting to be baptised are free to choose immersion, sprinkling or pouring. Parents have the choice for infant baptism or dedication of the child to the Lord. Jerry and I had all five of our babies dedicated to the Lord as babies. It was a very special time for us. We did our best to raise them in a Christian home. Baptism was left until they were adults and made the decision themselves. So there it is. I’m born again, definitely baptised and ready for heaven! How about you? This entry was posted in Baptism, Family, Free Methodist Church, Israel, Jerry, Me, Memories and tagged Adult, Baptism, Children, Dedication, Family, Free Methodist Church, Immersion, Israel, Jerrry, Me, Memories. Bookmark the permalink. My baptismal history is similar to your except for the ceremony in the Jordan River as we have never been to the Holy Land. To me, it seems like a renewal of vows on two levels. What a privilege. Thanks, Marian. Each time was a wonderful day!